Peak Floor Solutions has really enjoyed watching the transformations that can be accomplished using all of the Elite Crete product line. We have had projects ranging from commercial offices to residential basements. For more information at our Decorative Concrete Website visit Elitecrete Atlanta. 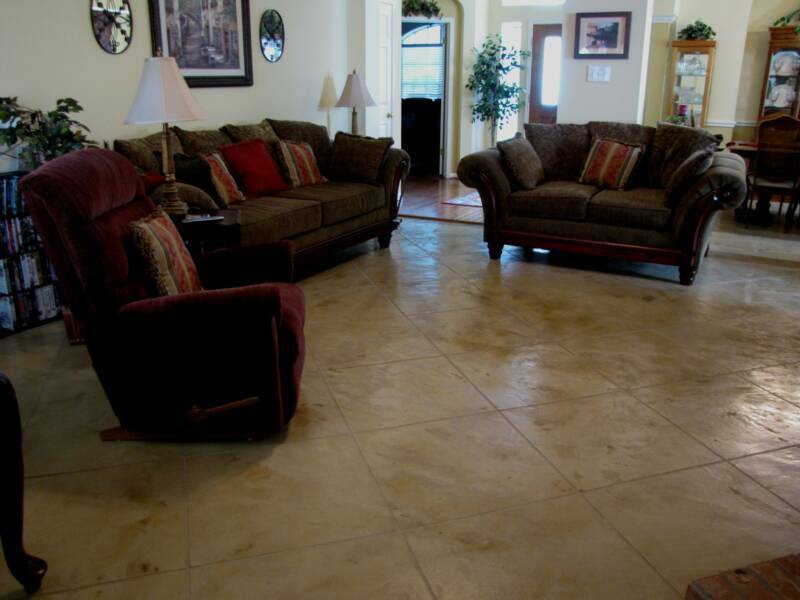 Carpets and laminate wood floors were removed and a stained concrete overlay of the surface was performed. Decorative saw cutting patterns into a floor opens up the true possibilities of each project. Tile patterns, borders, and sweeping arches are very popular. Your imagination is the only limit when it comes to a concrete overlay! These floors are a one of a kind hand crafted art. To help you in your research, much more information is available at Elitecrete’s website. The floor looks gorgeous!!! Finally something went right in my kitchen. I will spread the word. You were a pleasure to work with, much success in your business. We just wanted to thank you again for the absolutely superb job that you did on our paver floor. You arrived just as planned daily, you were always in good spirits even jovial, but most importantly, you made our 30 year old dull drab kitchen floor look brand new and alive again!! It is terrific to find an independently owned company that really takes pride in their work and products!